Taproot Theatre touring company "Foolish Wiseman"
BlueStreet Jazz Voices - tonight! There are several more opportunities for Shoreline/Lake Forest Park voters to learn more about the Shoreline Schools propositions that will appear on the Feb. 9 special election ballot. Jan. 5: Echo Lake Elementary PTA, 7 pm. Jan. 5: Kellogg Middle School PTA, 7 pm. Jan. 6: Shoreline Children’s Center PTA, 5 pm. Jan. 7: Room Nine/Meridian Park PTA, 7 p.m.
Jan. 12: Einstein Middle School PTA, 6:30 pm. Jan. 12: Highland Terrace Neighborhood Association, Highland Terrace Elementary School, 7 p.m.
Jan. 19: Third Place Commons at Lake Forest Park Towne Centre, 7 pm. Jan. 20: Ridgecrest Neighborhood Association at Bethel Lutheran Church, 7 p.m.
Jan. 26: Syre PTA in school library, 7 pm. • A four-year replacement of expiring levy for educational programs, maintenance and operations levy. The levy averages $22 million per year for each of the four years, 2011 through 2014. The maintenance and operations levy, which replaces the four-year levy passed by voters in 2006, would provide the district with about 20 percent of its general operating budget. • A $150 million bond for the modernization/replacement of Shorecrest and Shorewood High Schools. 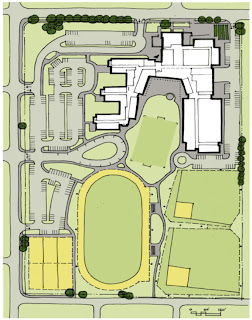 The 2006 bond approved by voters included funds for the planning and design for the two high school projects, but not for the actual construction costs. • A four-year capital levy for technology improvements and support. This levy would support the District’s instructional technology program and services and technology equipment replacement. For more information on the levy/bond proposals, visit Shoreline Schools. Vote for an environmental slogan for Shoreline. King County Councilman Bob Ferguson (pictured, right), who represents Shoreline, Lake Forest Park, Kenmore and part of north Seattle, was unopposed for re-election in November. Ferguson said Tuesday that he found the election a welcome change from his first two campaigns for the Council. In his first campaign six years ago, he defeated longtime Councilwoman Cynthia Sullivan by a 51 percent to 49 percent margin in the Democratic primary. Two years later, redistricting put Ferguson and fellow Democratic incumbent Carolyn Edmonds in the newly drawn 1st District. Ferguson won by a 52-47 margin. He had no Republican opponent in 2003, and he had a 75-25 percent margin over his 2005 Republican opponent. With most districts having little inter-party competition, the new non-partisan County Council elections were supposed to bring more competition in single-party districts. Ferguson said, however, that, while it may be true some day, it didn’t bring enhanced competition this year. Ferguson and three of the other four Council incumbents on this year’s ballot ran unopposed. The change from partisan to non-partisan County elections had the unintended consequence of complicating the process of filling the vacancy in the district that Dow Constantine held before he was elected County executive. Under a partisan system, the Council would have replaced Democrat Constantine from a list of three candidates selected by Democratic precinct committee officers in Constantine’s West-Seattle-area district. Now, the officially non-partisan Council ended the year in a deadlock between the four former Democrats and four former Republicans over a replacement. Ferguson said he expected the Council to reach agreement on a compromise candidate when it reconvenes in January. The person appointed would serve until next year’s election when someone would be elected to fill the last 13 months of Constantine’s Council term. As for his own political future, Ferguson confirmed that he is considering a run for State attorney general in 2012, but he said that he would run only if current Republican attorney general and former King County Councilman Rob McKenna (pictured, left) doesn’t run for a third term. Many observers expect McKenna to run for governor. Ferguson said he needed to raise at least $2 million to mount a statewide campaign. He has already taken one important step toward a run for attorney general. He has reactivated his status as a member of the bar. Ferguson, who worked for a large Seattle law firm before his run for County Council, had switched to inactive status. Some observers had mentioned Ferguson as a candidate for King County prosecuting attorney three years ago, but his bar status was then inactive. He has now returned to active status. • On the election of County Assessor Lloyd Hara with 32 percent of the vote in a five-person race, Ferguson said that any form of runoff would have brought the same result. He blamed the awkward election on former Assessor Scott Noble’s resignation coming too late for a primary. • On the elimination of most election-ballot drop boxes, Ferguson said that the Council had to make the move at a time when it was cutting human services and straining to keep police protection. Shoreline City Councilman Keith McGlashan (pictured), the only member of the Council re-elected in November, says that many Shoreline voters were “disengaged” in the election. “I’m guessing that the low participation of the all mail-in voting and passing up Shoreline voting altogether is a statement of the visible infighting and block voting that has been on the council for the last several years,” he told me last week. McGlashan noted that the voter turnout in Shoreline was slightly higher then countywide but that many voters skipped the local races. He said that many people saw his name alone on the ballot and didn’t realize that he had a write-in opponent, Wendy DiPeso. He added that it would be interesting to get the actual write in tallies to see how many of them were actually for DiPeso, although the expense is too much to bother with. McGlashan is the first Shoreline Council incumbent re-elected in the last four years. He said that Councilman Ron Hansen’s defeat may have happened because voters simply decided that it was time to move on. McGlashan said that he is excited about the new council. The Dale Turner Family YMCA is pleased to announce that online registration is now available for many of its programs and activities, including swim lessons, cooking, ballet, karate and more. 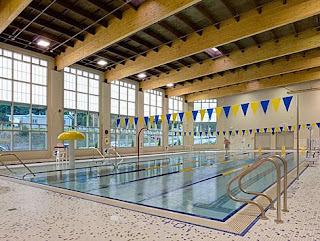 Space is still available for the swim lesson session that begins January 4. As the nation’s leader in aquatic programs, the YMCA offers a progressive swimming program with levels grouped by age and ability for infants through adults. All classes are supervised by a certified swimming instructor, and safety is emphasized at every level. Free ability evaluations are available for parents who are unsure of their children’s skills. To register for swim lessons and other YMCA programs see the website. Financial assistance, to the extent possible, is available to families in need. Please call 206.363.0446 for more information. The Shorecrest High School girls’ basketball team finished the pre-holiday portion of its season with a 3-2 Wesco South Division record that put the Scots in a three-way tie for fourth in the Division. Shorecrest took a 4-2 overall record into a non-league home game against Burlington-Edison of the Northwest league’s 2A division, Tuesday, Dec. 29 at 7:30 p.m. The Scots resume Wesco South play Wednesday, Jan. 5 with a 7:30 p.m. home game against Meadowdale, one of the three teams ahead of the Scots in the Division. The Shorewood girls, meanwhile, are tied for seventh with a 2-3 Division record. Shorewood took a 2-4 overall record into a Tuesday night non-league home game against Centralia. The Thunderbirds resume Wesco South play Wednesday Jan. 5 at Glacier Peak, the team tied with Shorewood for seventh. In Shorecrest’s last pre-holiday game, the Scots lost at home 83-45 to Jackson, one of the three teams tied for first. Jackson ran away with the game after taking a 41-12 halftime lead. Shorecrest—Casey Axelson 2, Melissa Ruhlman 0, Allison Jones 2, Rachel Schrote 8, Christina Jarvis, Shannon Schachle 2, Mickey Greenburg 0, Brianne Lasconia 8, Addy Ibsen 0, Angel Tulee 7, Janie Uppinghouse7, India Matheson 5. In Shorewood’s last game, the Thunderbirds beat Lynnwood 48-40 at Lynnwood,. Masha Shtikel scored 13 points and Shorewood pulled away in the fourth quarter. 05:21 Male, 2 months, difficulty breathing. 07:36 Female, 60, injuries from a fall at home. 10:15 Male, 80, bleeding from a catheter. 10:42 Male, 71, weakness and injury from a fall at home. 13:21 Automatic fire alarm at a residence. No fire. Alarm malfunction. 14:54 Female, 91, back pain and dizziness. 15:04 Teenage male, head lacerations from fall at Highland Ice Arena. 15:45 Automatic fire alarm, no fire. Resident cooking. 17:00 Automatic fire alarm, residence. No fire. Alarm malfunction. 19:41 Female, 85, anxiety and shortness of breath. 19:42 Male, 59, at adult family home, unresponsive. 20:31 Male, 38, eyebrow laceration from walking into a door. 20:34 Male, 15 months, seizure. 20:40 Female, 5 months, possible CPR in progress. 21:17 Female, 89, diabetic emergency. 21:38 Male, 70, injuries from a fall at home. 22:40 Male, 21, disoriented and under the influence of alcohol at Rite-Aid. Martha Rose from Green Building. 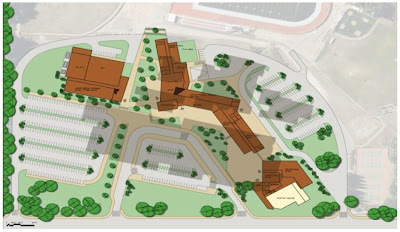 There will be a pre-meeting viewing of the model for the new Shorewood High School and information about the upcoming school levy from Craig Degginger and Wes Brandon. You are cordially invited to the Highland Terrace Neighborhood meeting on Tuesday, January 12, 2010. The meeting begins at 7 pm in the Highland Terrace School Library located at 100 N 160th St, Shoreline, WA 98133, one block west of Greenwood Ave. N. Parking is available in front of the school. Enter through the main entrance, turn left down the hall to the library room. Bob Barta, Director, (HTNA) Highland Terrace Neighborhood Association. 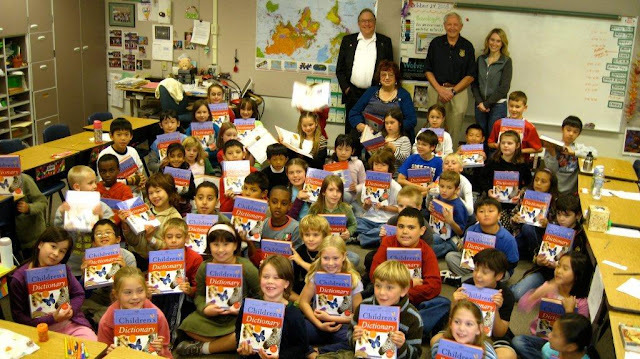 The three Rotary Clubs of Shoreline have a project to bring new dictionaries to every third grade student in the Shoreline School District, feeling that the hardcover, beautifully printed books bring words alive for the children. Rotarians deliver the dictionaries to each classroom and enjoy helping as the children look up a few words and share their findings. The teachers often use the new books for a curriculum week in the classroom before they go home with the students. In the thank you letters the Rotarian receive from the children, there are many stories of these books becoming a reference for siblings and sometimes the whole family. The Shoreline Library offers appointments with volunteers who can assist people to find health insurance. Statewide Health Insurance Benefits Advisors (SHIBA) volunteers are trained through the Office of the Insurance Commissioner to assist people of all ages with health care coverage, prescription drugs, long-term care, and Medicare questions. A SHIBA volunteer is available at the Shoreline Library on the 1st and 3rd Wednesdays from 1:00 - 4:00 pm. Call 206-362-7550 for an appointment. The Prince of Peace Lutheran church in Shoreline has a 12 person handbell choir which plays twice a month at worship services. The church owns about forty bells, which were stored at the church. In mid-November, the choir was shocked to discover two cases of bells missing. 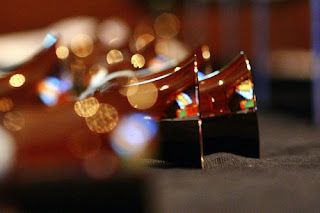 17 handbells were gone, valued at approximately $4,500. Two other cases, containing 20 bells, were not touched. It took only two weeks for Shoreline Detective Bob Inn to discover that the cases of bells had been sold in Bothell for $50 and $75 per case. Per Sgt. Katie Larsen, a suspect has been arrested and charged in the theft. The bell choir missed only one practice, and Bethel Lutheran church in Shoreline loaned their bells for the service which occurred before the bells were recovered. The church credits terrific police work on the part of Shoreline and Bothell police, and a detective who understood the importance of the bells to the church community. 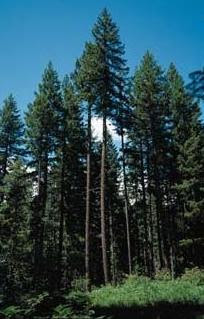 Shoreline residents have several options for Christmas tree disposal over the holidays, including recycling the trees as wood chips. 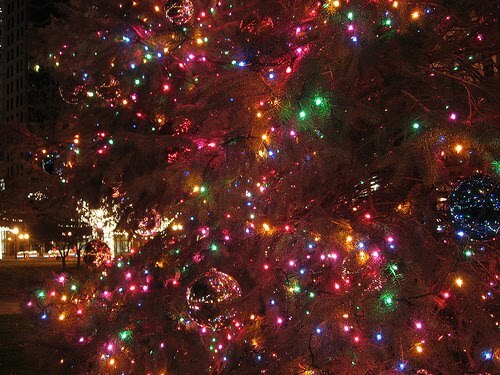 The City of Shoreline is hosting a Christmas Tree Recycling Event on Saturday and Sunday, January 9 and 10, at the Meridian Park Elementary School parking lot, 17077 Meridian Avenue N, 9 am to 3 pm. Since this free event is open to Shoreline residents only, please bring proof of residency. 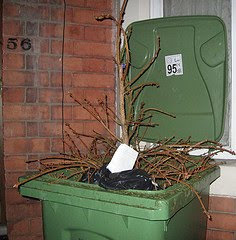 Visit the City of Shoreline webpage for more details about what to and what not to bring and other ways of recycling Christmas trees. For more information, call 206-801-2700. Lake Forest Park is holding a bulky yard waste event on Saturday, January 2, 2010 from 9 am to 2 pm in the City Hall Parking Lot. City residents should follow the signage and enter through the upper parking lot near the professional building. Rule #1: If you have something to hide from the cops, don't call attention to your vehicle by your driving, by expired tabs, by looking furtive when you pass a police car. 12-9 Traffic stop for expired tabs. Cited for driving with suspended license. 12-9 Traffic stop. Marijuana pipe on front seat. 12-9 Traffic stop. Marijuana in car. 12-11 Traffic stop. Cited for driving with revoked license. 12-15 Traffic stop. Driver had 14 grams "ice". Cited for controlled substance. 12-19 Traffic stop. Driving with revoked driver's license. Marijuana and paraphernalia on seat. Rule #2: If you call the cops to your house, hide your stash. 12-11 Police called to mediate family dispute. Marijuana pipe on coffee table. Rule #3: Pick your drinking buddies carefully. 12-12 Bar fight at Ricky's Bar, 632 Richmond Beach Road. "Michael" and "Kenneth" got into a bar fight about drugs and knives. One shot the other in the pinky toe. The one who was shot beat up the shooter. Both were arrested. 12-7 Costco. Purse stolen from shopping cart. 12-11 Groceries taken from unlocked car at Safeway parking lot, 153rd and Aurora. 12-11 UPS delivered package, homeowner put it just inside front door and left, leaving the door unlocked. Package stolen. N 178th Pl. 12-17 GPS stolen from unlocked car on NE 151st. 12-18 House left unlocked. Bedrooms ransacked. 12-16 Man attempting to buy a car at a dealership on NE 159th. Dealership informed him that multiple credit reporting agencies said he was now deceased, along with listing several addresses in Florida and Chicago. 12-9 Female student at Shorecrest pushed by her boyfriend. Counselors called police but girl refused to cooperate. 12-14 Vehicles parked in driveway on 9th Pl NE vandalized. 12-14 Vehicles parked in apartment complex on 14th Ave NE vandalized. 12-14 Piece of fire equipment stolen from fire scene at NW Discount World. We have added a local restaurant link to the Shoreline Area News. Scroll down in the right-hand column of the News and look for the link: Shoreline and LFP Restaurant Reviews on Urbanspoon or click here. Urbanspoon has information on all the restaurants in Shoreline and Lake Forest Park. You can rate restaurants and vote for your favorites. If you find information which needs to be updated, there are links at the very bottom of the page to Add Restaurant or provide Feedback. 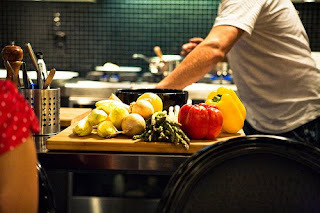 It includes all places to buy prepared food, including carry-out. If you are interested in writing a review of a local eatery for the News, please contact us. 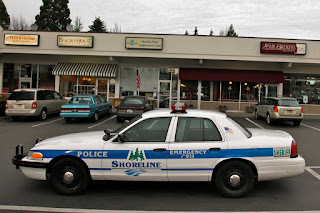 I had a long conversation with a Shoreline cop on December 21. It was a random encounter with a sixteen-year veteran who wanted to be sure that I was writing about police work from an informed point of view. We covered a lot of topics in two hours. He confirmed my information that the most dangerous police call was for domestic violence. "A man's house is his castle," he quoted. You are going into someone's home, you are entering their space. They will react more strongly and more violently than they would on more neutral ground. They know the space. They know where the weapons are, including the knives in the kitchen. It is law in Washington that you have to make an arrest in a domestic violence assault. The person who called you may have just wanted some help in an argument. When they find out you are going to arrest their loved one, they often turn against you. Because of this, two cops go on any domestic violence call. I asked about the Pierce county police attacks and if he thought there would be copycats. "Absolutely," he said. "They have found out that police are not invincible." Look at the school shootings. They have continued and they have learned from the previous killings. The Virginia Tech killer chained the doors shut so his victims couldn't escape. The one thing the attackers have in common is that they want to die. They want to take as many people as possible with them, and they want their name to be known. They either shoot themselves or put themselves in a "suicide by cop" situation. I wondered if cops would change their behavior because of the Lakewood killings, perhaps doing their reports at the station house instead of in public places. "Absolutely not," he responded. If cops feel the need to hide in the station house, what does that say about the safety of the general public? It's our job to be out there and visible. The fact that driving a police car or wearing a police uniform puts us in danger is part of our job. We are there to protect the public, and people need to see us. The only thing that might change is that instead of four cops at one table, they might sit at two different tables, but they will still be there. Our job is to protect life, protect property, arrest perpetrators, and restore normal order. We'll keep on doing our jobs. I think that I would have gotten the same information from any cop I talked to. When I got to my car and turned on the radio, I heard the report of two more cops being gunned down in Pierce county. They had gone on a domestic violence call, to help remove a man from his brother's house. In a very small, upstairs bedroom, the man pulled a gun and starting shooting. One officer was released from the hospital and the other died on December 29. But I couldn't help thinking. We expect cops to put their lives in danger to protect us - but we are thinking of dramatic situations like bank robberies or shoot-outs. I can't think of any other job where you are in danger just by wearing a work uniform or driving a company car. Voters in Shoreline, Lake Forest Park and the rest of King County contributed to Washington’s approving Referendum 71 and defeating Initiative 1033, but November's statewide vote showed a Washington sharply divided on one issue, but generally united on the other. The vote to approve R-71, the expansion of Washington’s domestic partnership law, showed a split between the Puget Sound area and the rest of the State. The vote against I-1033, however, showed it losing throughout the State. That shows a state divided on social issues, but not on the economic issue presented by I-1033. The expansion of domestic-partnership rights passed 53 percent to 47 percent, but won in only 10 counties, all bordering on Puget Sound but won in no counties east of the Cascades or south of Olympia. Initiative 1033, the Tim-Eyman-sponsored measure to freeze government spending, failed by a 58-42 percent margin, passing only in three Northeast Washington counties, four Central Washington counties and eight Southwest Washington counties. The Shorecrest boys’ basketball team finished the pre-holiday schedule in second place in the Western Conference South Division after the Scots lost their first game of the season to still-unbeaten Jackson at Jackson Friday, December 18. Shorecrest resumes its schedule Tuesday, December 29 with a non-conference game at Burlington-Edison of the Northwest League’s 2A division. The Scots return to Wesco play Tuesday January 5 at Meadowdale, Shorecrest gets a second chance at Jackson in a home game, Friday, January 29. Shorewood, meanwhile, dropped into a four-way tie for third with a 53-40 home loss to Lynnwood. Shorewood, Lynnwood, Meadowdale and Montlake Terrace all have 3-2 division records, behind Jackson’s 5-0 record and Shorecrest’s 4-1. Shorewood plays a home game Wednesday, December 30 against Everett of the Wesco North Division and returns to Wesco South play with a home game against Glacier Peak, Tuesday, January 5. Shorecrest trailed Jackson throughout the 69-60 loss but closed to within two points in the third quarter. Shorecrest—Clevenger 10, T. McCoy 2, Diel 2, Hake 6, Bateman 0, B. McCoy 7, Brown 19, Chibuogwu 14. In Shorewood’s 53-40 loss to Lynnwood, Lynnwood overcame a three-point halftime deficit by outscoring Shorewood 35-19 in the second half in a Wesco South win. Micah Mitchell scored a team-high 13 points for Shorewood. Shorewood—Gage Carroll 2, Ben Andrews 2, Micah Mitchell 13, Semir Kadiric 8, Peter Berquist 4, Jerry Smallwood 4, Adrian Simpkins 5, Duncan Hendrickson 0, Josh Hawkinson 2.
from the Shoreline Area News - Diane Hettrick, Sonya Reasor and Evan Smith. The Rachel Maddow show did a major feature on the Shorecrest / Shorewood video battle on December 22, spending almost the first eight minutes of the show on the story, which was extremely complimentary to the schools, the students, and the video classes. The hapless senator she tied into the story did not fare so well. The schools are referred to as "Seattle area" schools, but the teachers are mentioned by name. The show put links to the school videos on its website. Watch the Rachel Maddow segment here. It is third on the Most Viewed list for the show. Get a head start on those New Year's Resolutions to get more exercise by talking advantage of local resources. Even though Shoreline and Lake Forest Park are urban areas with few sidewalks, there are still places to walk. The City of Shoreline has teamed up with Seattle & King County Public Health to create a Walking Map of Shoreline. For more information, call Shoreline Parks, Recreation and Cultural Services at 206-801-2630. 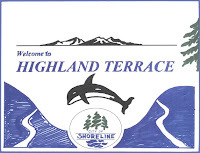 The Shoreline Pool is at 19030 1st Avenue NE, Shoreline, WA 98155, next to the Shoreline Conference Center. The phone number is 206-801-2650. Monday - Friday: 5:30 a.m.- 8:45 p.m.
Sunday: 11:30 a.m. – 3:00 p.m.
Winter school break schedule (Dec. 21-Jan. 3), click here. Winter 2010 schedule (Jan. 4-Apr. 3), click here. In partnership with Cascade Orienteering, the City of Shoreline offers an orienteering course at Hamlin Park. The route map and booklet are posted online. Click the following links to see the Hamlin Orienteering Map and Hamlin Orienteering Booklet. Update: May 6, 2010. The Blue Sunshine Preschool and Daycare has been closed and its owner / operator charged with child molestation. The Blue Sunshine Preschool and Daycare just opened in North City and is currently enrolling 2 - 5 year-olds for full-day or half-day care. In addition, Blue Sunshine will take drop-ins on half-day schedules. 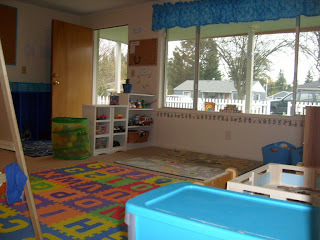 Blue Sunshine is an in-home preschool/daycare near North City Elementary. Owner Jamie Day says, "I have the affordable rates of a new school, but the experience of someone who grew up in a home daycare and went on to work in centers and preschools for several years, including Bright Horizons!" 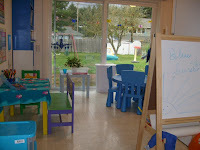 Blue Sunshine bases learning activities around the children's interests and provides art activities, science experiments, music time, outdoor play, story time, and dramatic play. 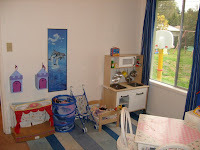 The school has a playroom, a reading room, a music/dramatic playroom with lots of children's instruments, an art/lunch area, and a huge back yard. Healthy lunch and snacks are provided, per the USDA food program. Information on rates is provided on the Blue Sunshine website. For more information or a tour of the facilities, contact Jamie Day by email or phone 206-949-6689. KING5 is running a poll on the competing videos from Shorewood and Shorecrest schools. Shorecrest released the first video, which featured several classes, some dance team, cheerleaders and others in a lip-sync of the Outkast song Hey Ya. It went viral on the internet, currently at over 96,000 views on YouTube. Shorewood then responded with a video of its own, with students, including the men's swim team, lip-syncing to Hall and Oats You Make My Dreams Come True - only they did it backwards. Their video registers 163,000 hits to date on You Tube. See the KING5 story and vote here. 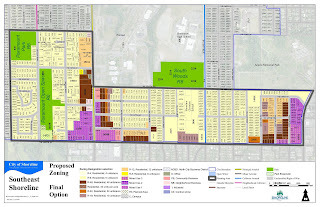 A committee has been hard at work to develop a plan for the southeast section of Shoreline, which includes the neighborhoods of Briarcrest and Ridgecrest. Community members and planning department met for several months to develop guidelines for the future of the Southeast Neighborhoods Subarea. 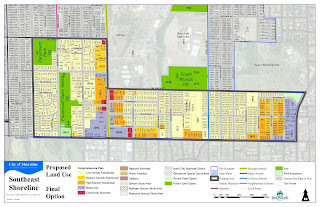 The resulting report is available online at the Southeast Neighborhoods Subarea Plan web page, According to Associate Planner Miranda Redinger, it includes the final report, zoning and Comprehensive Plan as well as maps and summaries for most of the meetings. For a few days this week, the Hopelink food banks are transformed into toy banks. Food is pulled from the shelves, and families who register are able to have a holiday shopping spree so their little ones will have a Christmas to remember. This year, the demand is higher than ever, with the number of registered families catapulting from less than 750, to 1000. Hopelink's toy banks are going to be open at most locations today, tomorrow, and Wednesday, and they could still use more gifts, particularly for teens and pre-teens. If you are interested in donating, you can drop toys off at any Hopelink location. For more information, go to www.hope-link.org.